Hummingbird feeders are for humingbirds.....right ?? It was a nice afternoon so I thought I would put my camera on the tripod and wait for the hummingbirds to feed. I noticed that our feeder attracted a butterfly and some bees. The hummingbird came to the feeder and seemed that he (or she) didn't want to share it with the butterfly. 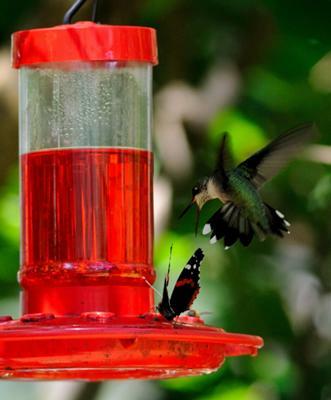 The butterfly didn't want to leave....so the hummingbird flew right at it....and in so many words said scram!! I used a nikon D700 with a nikon 300mm f/4 telephoto. I should have used a flash, but didn't.